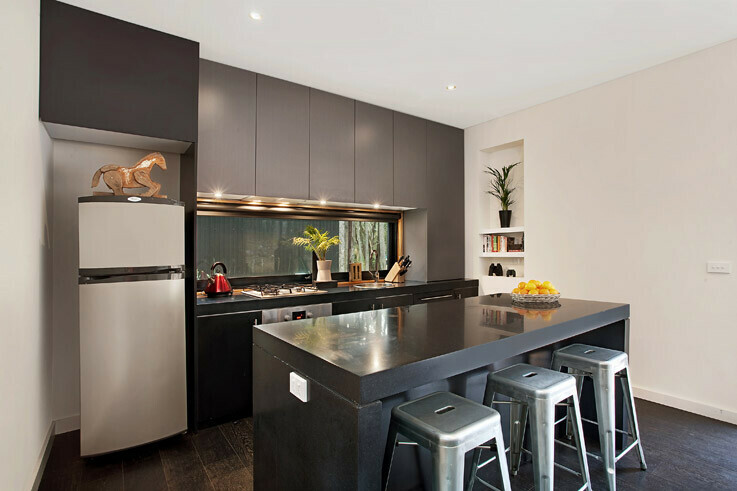 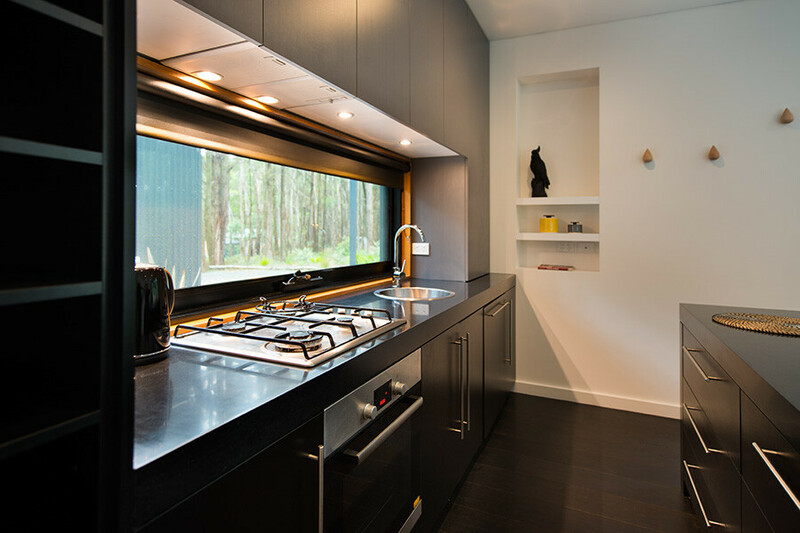 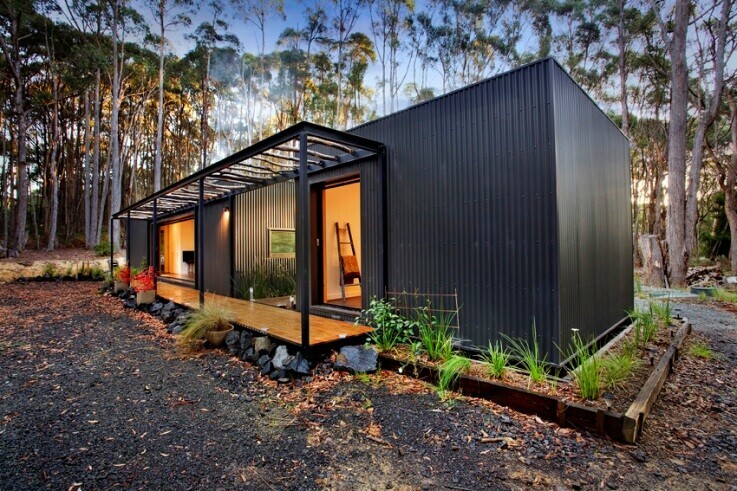 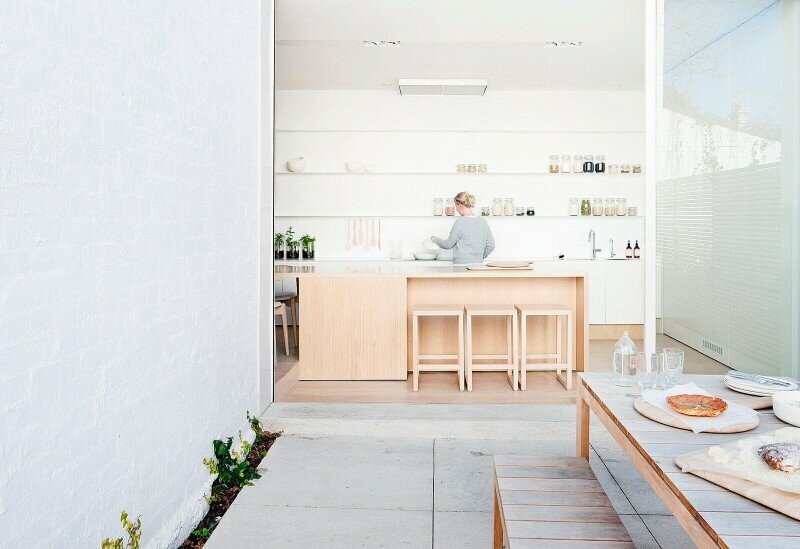 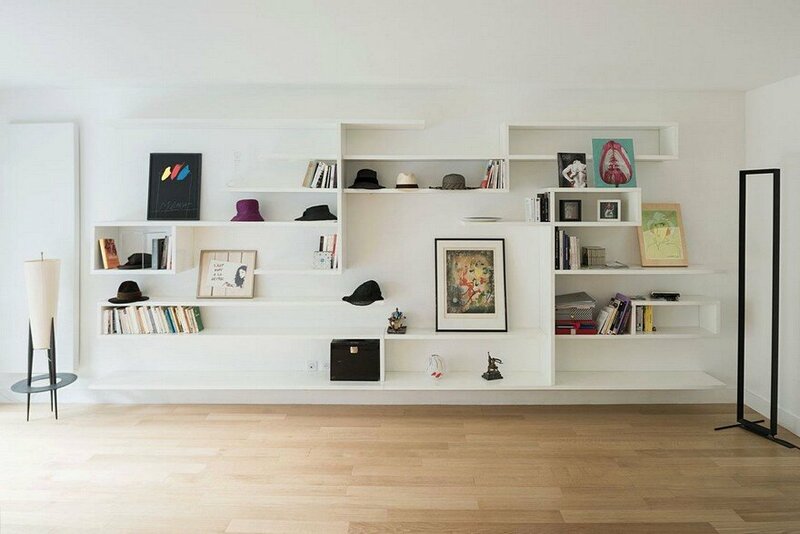 Musk Bunker is a stylish modern prefab cabin designed by Melbourne-based Modscape. 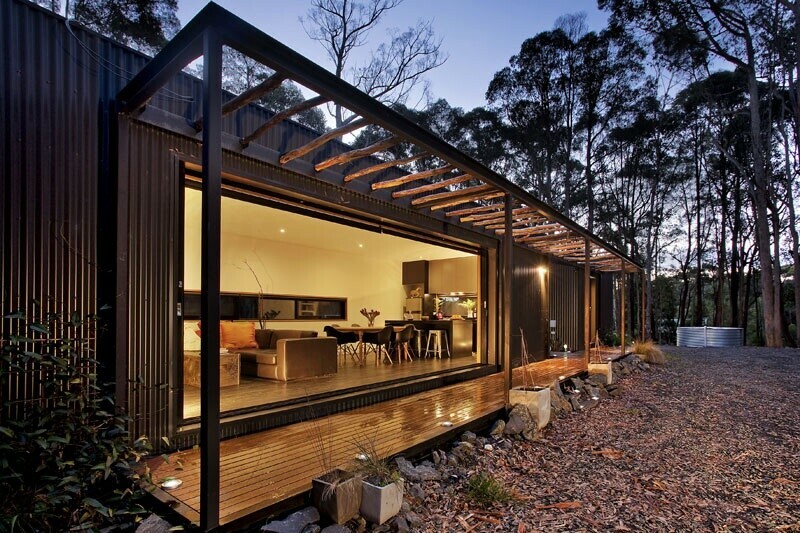 The design concept lends itself to the ideal bush hideaway. 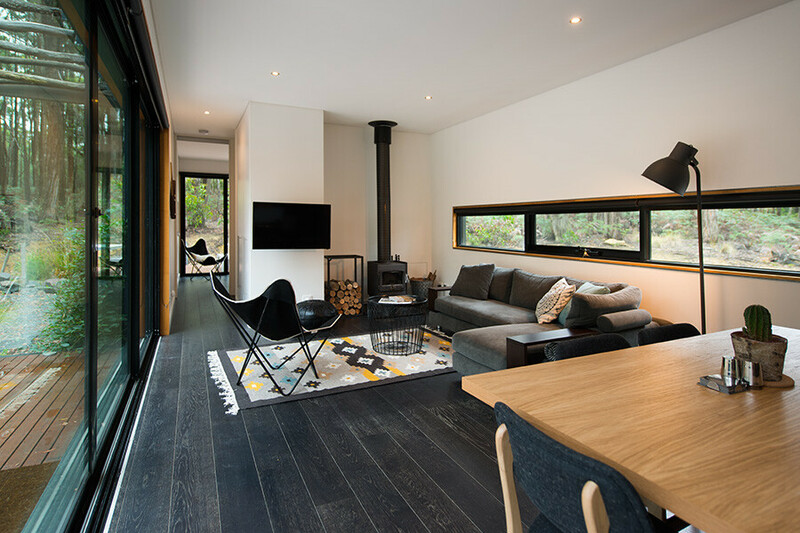 Perfectly proportioned and finished, this discreet two bedroom getaway is a typical example of the way Modscape tailors design outcome with habitat. 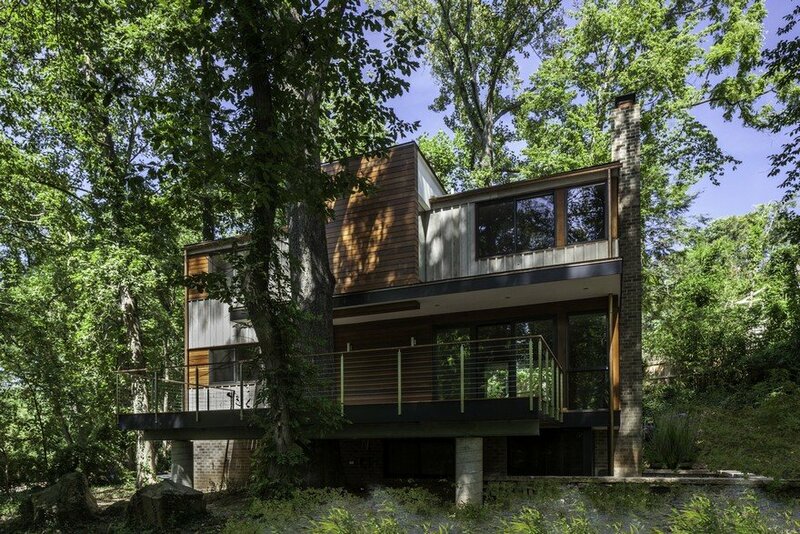 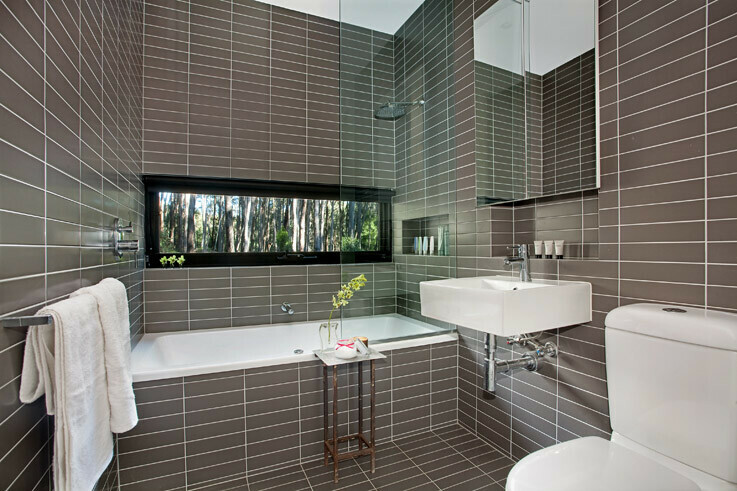 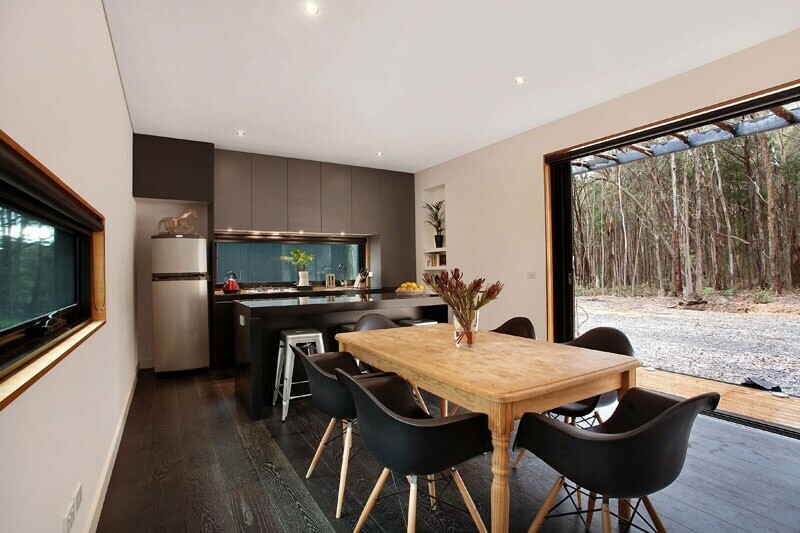 Nestled in the native bush surrounds, a lightly treed setting provides an ambient backdrop to the contemporary interiors. 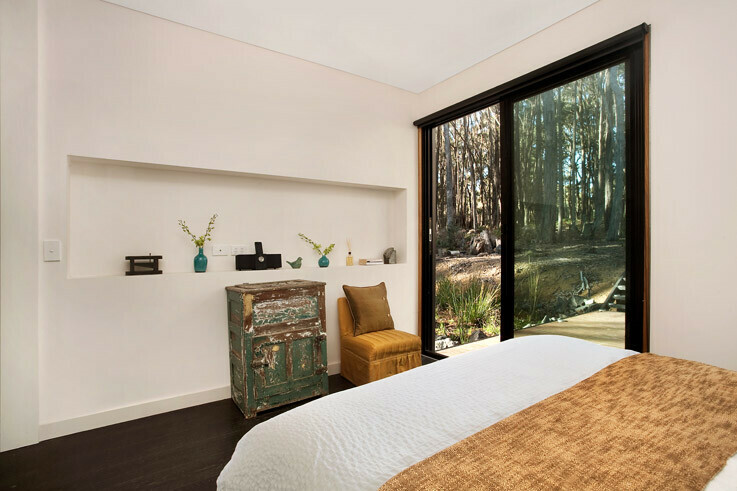 A large circle of dense bushland was cleared to give the illusion of botanical seclusion with the home positioned in a linear orientation across the centre of the clearing to provide a 360 degree panoramic view of pure landscape. 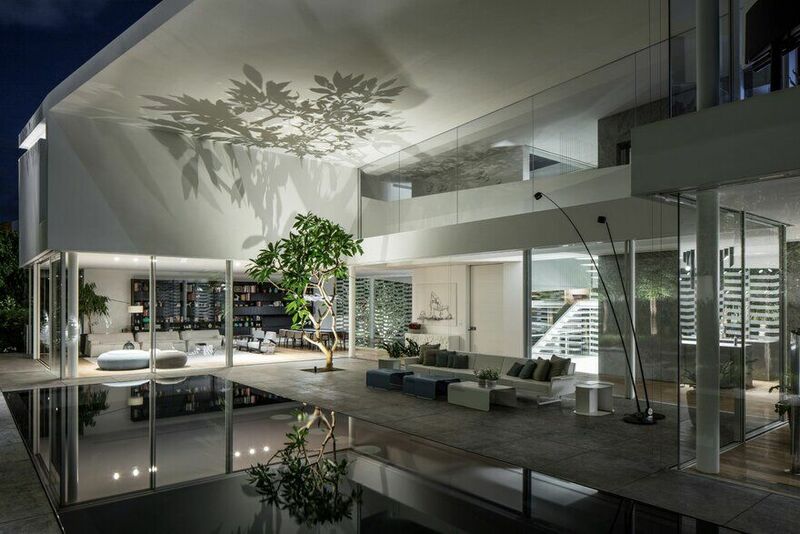 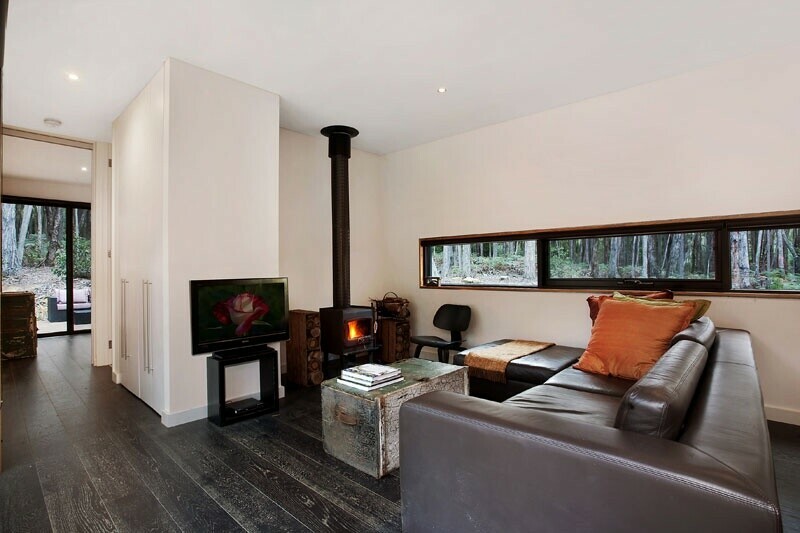 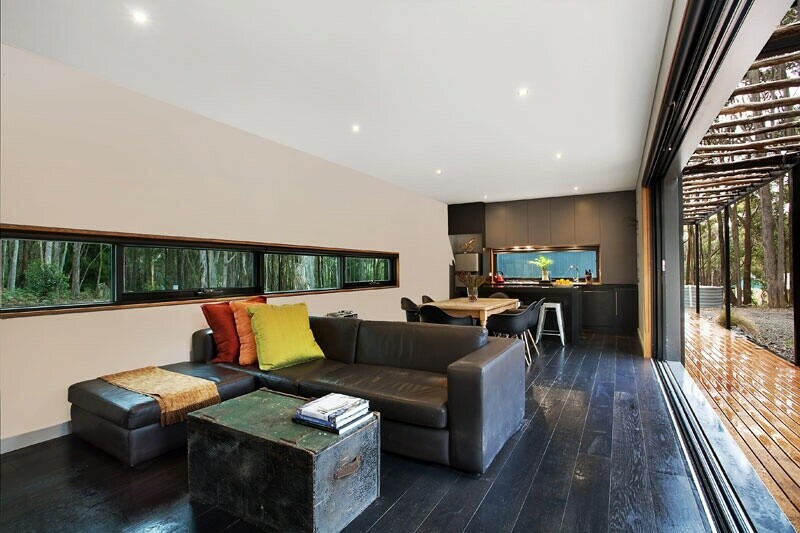 Large glass sliding doors provide panoramic views of the majestic native surrounds. 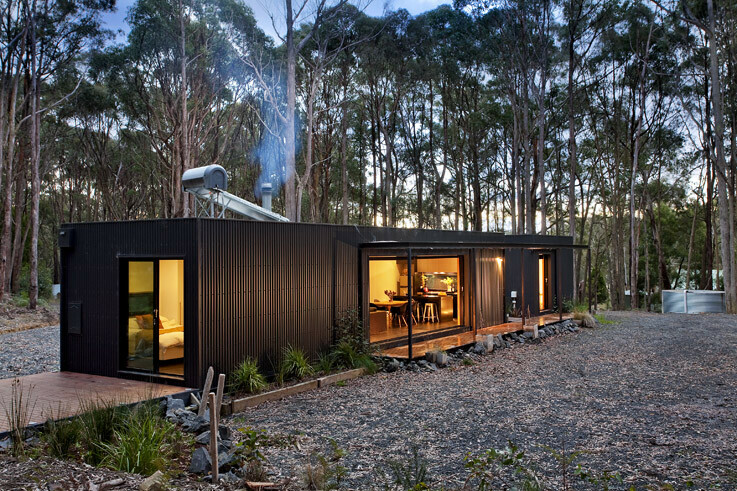 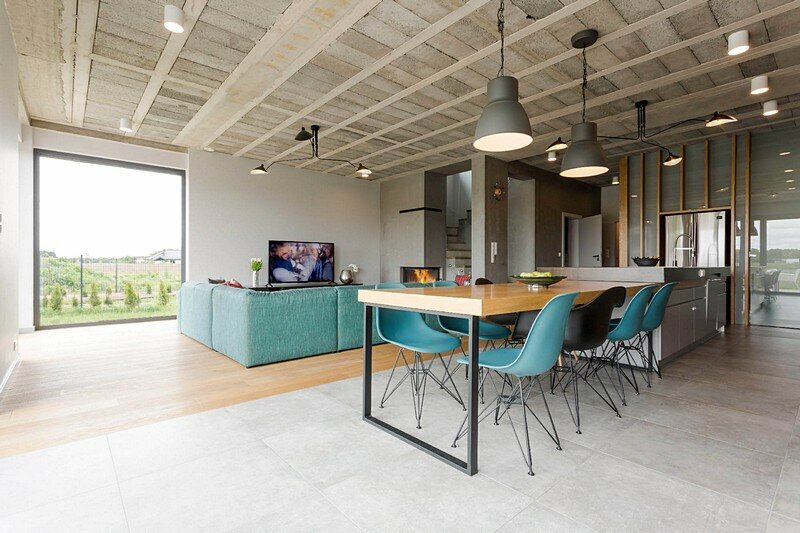 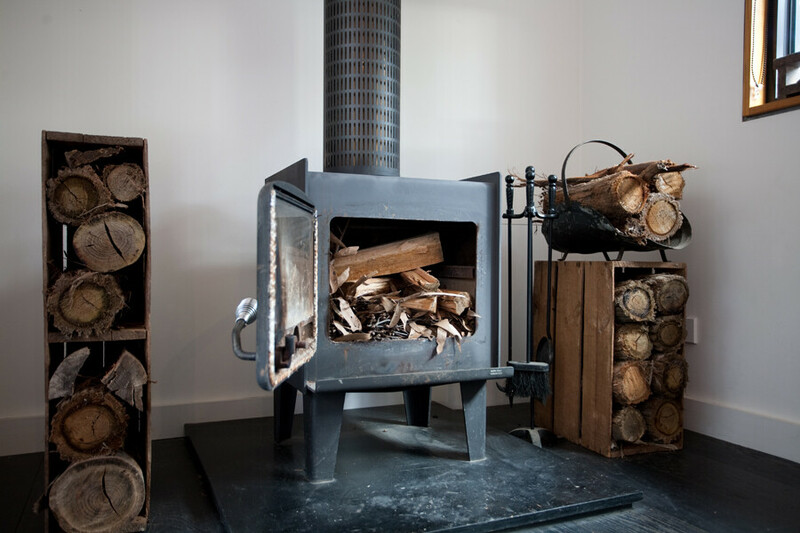 Comprised of two modules with covered decking between and a pergola at the front, the charcoal corrugated exterior in combination with floor to ceiling charcoal joinery in the kitchen, black oak flooring throughout and wood fireplace, creates a unified ambience of light and dark in sympathy with the home’s natural surroundings. 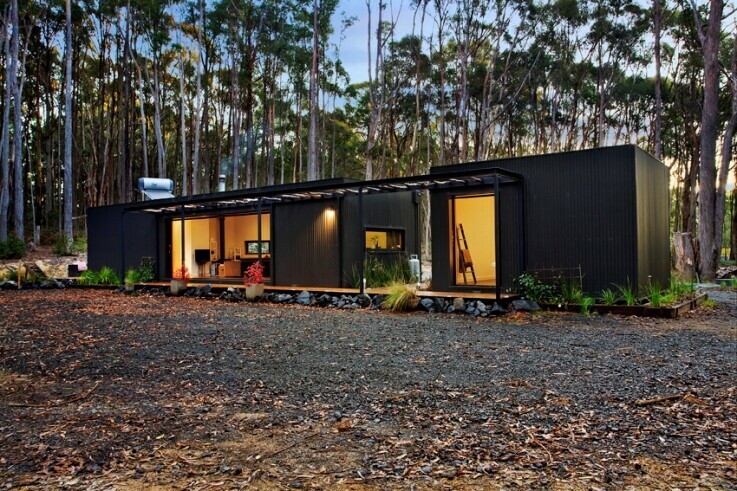 The larger of the two modules houses a spacious bedroom, bathroom, laundry and open plan kitchen, while the smaller module acts as a studio offering an additional bedroom and bathroom ideal for guests. 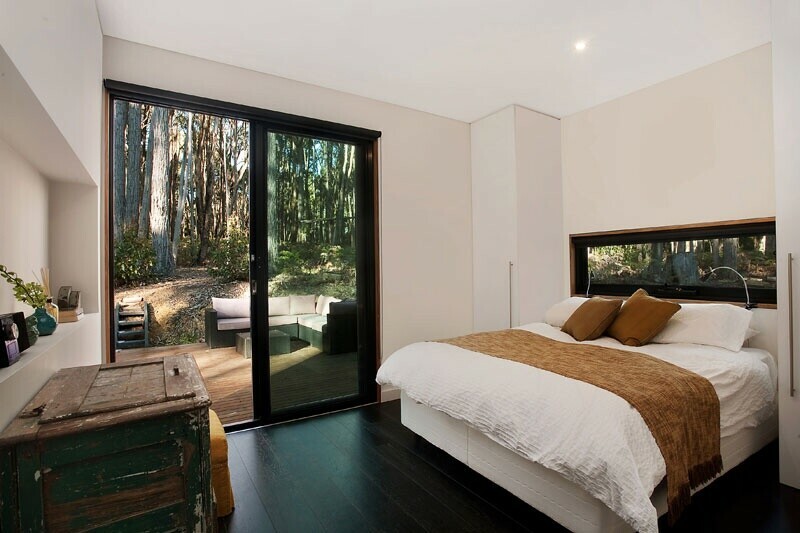 The finishing touch of sustainable hardwood timber decking and fallen native branches incorporated into the pergola adds a unique rustic style, making this two bedroom getaway the perfect place to bunker down for the weekend.